There is a part of my body that I am pretty proud of. You honestly won't guess it. It's the eyes. Oh yeah, they may be small but they have been kind to me by scoring a visual acuity of 6/6 for the vast majority of my life. Yes, I said majority. While I can't assure they are still the same now, at least I do not have to make friends with glasses or contact lenses at the age of 31. Seeing how inconvenient, distressing and costly it can get once you become myopic, one of my biggest wishes for my children is that they can maintain good vision and learn to take care of their eyes. Recently, the husband contracted a case of corneal ulcer as a result of infection due to prolonged wear of lens and had to go for frequent checkups at the specialist clinic. Combined with the fact that Angel is getting ready for primary school, the global prevalence of smart devices and the undeniable truth that Singapore has one of the world's highest myopia rates, all of these just sounded the alarm bells and made me determined to take bigger steps in working towards good eyesight for my kids. 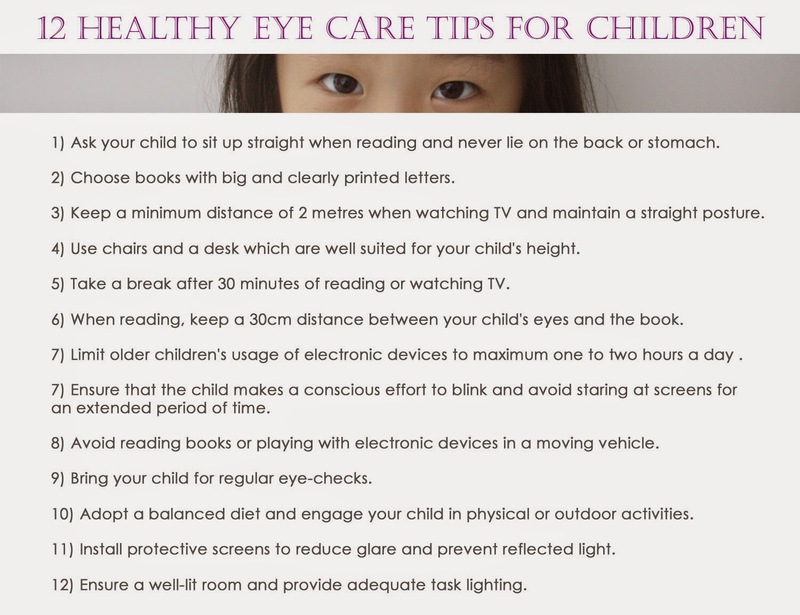 Here are some eye care tips that many of us may know of but it is always good to recap them. Other than bearing them in mind, we have to make sure we put them into practice especially for our little ones. It's not hard to realise that one of the key factors in ensuring good eyesight is light. According to a survey done by 3M Singapore through random sampling of 300 male and female respondents aged 25-55 years old, findings show that 71% of these respondents felt that the room lighting alone is sufficient for reading, 55% do not know the difference between LED and florescent lamps and 51% are unaware about the physiological effects of excessive light glare. I will be the first to admit that while I never did feel that room lighting is adequate for the kids to read and write, I also never made the effort to get a proper lamp for them or myself. Until now. And you bet I wish I had done that earlier because yes, a good task lamp makes the world of a difference. 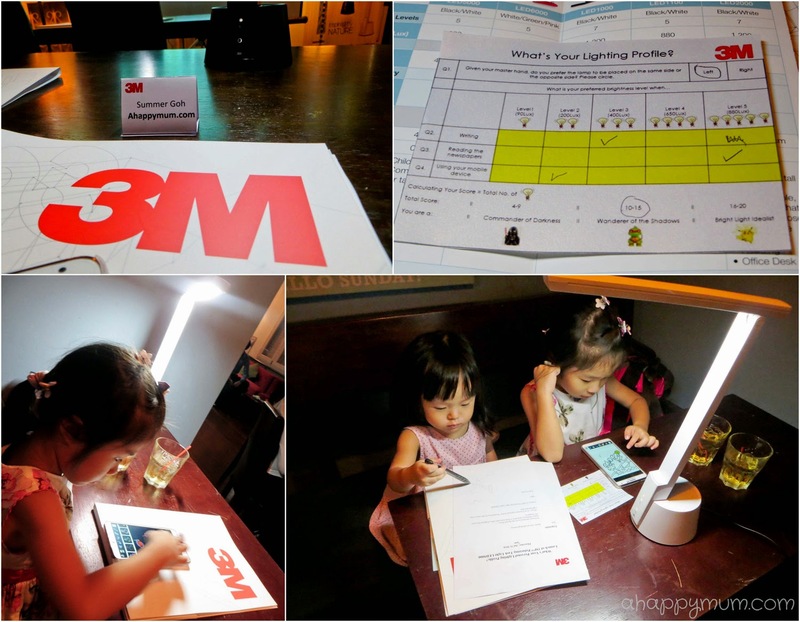 At the launch event of 3M LED5000 Polarizing Task Light, my world was instantly lit up when I learnt about light and brightness. Did you know? 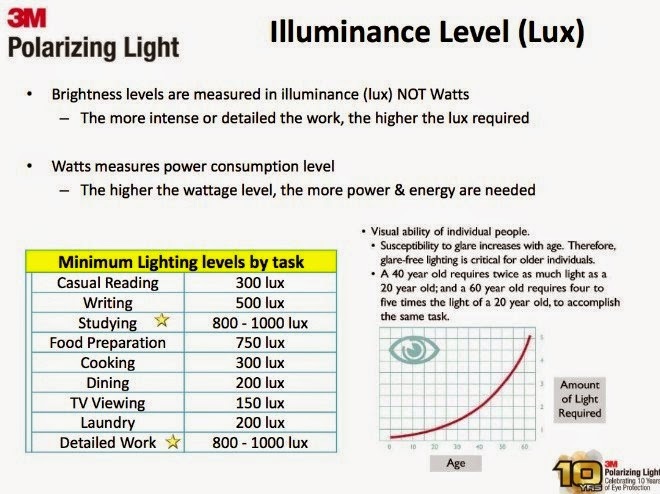 Brightness levels are measured in illuminance (lux), not watts which measure power consumption levels. Depending on the intensity and nature of the work, different lux levels will be required. For instance, studying requires a minimum of 800 lux while watching TV needs only 150 lux. Through a simple quiz where you choose your preferred brightness levels when writing, reading and using a mobile device, we discovered our lighting profile and both Angel and I fall into the "Wanderer of the Shadows" category. This means that while we are not too fond of darkness, we do not like things to be overly bright either. Last but not least, we also learnt that LED lamps are energy-saving, lasting and eco-friendly. Unlike traditional fluorescent lights, LED lights do not use mercury, minimise UV rays and provide a steady source of light that does not flicker. Here's showing you the features of our new LED5000 and why we are simply so in love with it. In addition to the beautiful exterior and chic design, it is also worthwhile to know about the technology in this lamp that makes it superior. Over the years, 3M has been continuously improving the technology and design of their lamps to provide better reading comfort. One of the key factors to their success is a technology unique to the company: the 3M Polarizing Filter Technology. The LED5000 is fitted with 3M’s Polarizing Filter Technology, which consists of a 3M proprietary optical film to reduce glare by up to 80%. 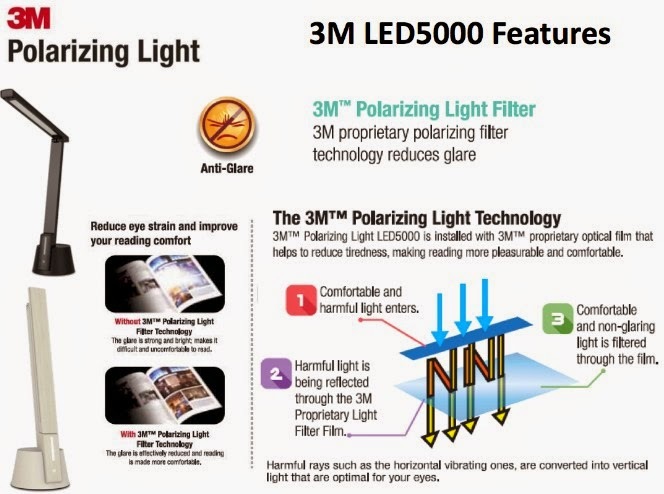 While most other lamps allow normal light rays comprising both comfortable and harmful light to enter, the 3M polarizing optical film only filters comfortable light through; at the same time, it converts the harmful rays into optimal lighting as well. As such, only optimal light reaches your eyes, minimizing eye strain and allowing for longer hours of comfortable reading. There, so this is how my blogging corner looks like now. Personally, I love the sleek white and minimalistic design of the LED5000; it doesn't even take up much space but it sure makes its presence felt. It may be too early for me to say but I'm hoping I will never have to buy a pair of glasses until *touches wood* I suffer from presbyopia (老花眼) one day. Far more importantly, it feels good knowing that the coming to 5-year-old and 2-year-old kiddos, who still have a long way to go in life, now have an awesome lighting buddy with them whenever they read, study, draw or write. A light that has no harmful rays, reduces glare, protects eyes, saves costs, does not heat up and is safe for children to use - Perfect. While all of us hope for good eyesight, I think it is fair to say that every home needs a good task light. Do you have one in your house already? If you don't, well, here's a chance for you to win for yourself a sleek white 3M LED5000 Polarizing Task Light too! To participate, leave a blog comment below with your name, email address and tell me your favourite feature of the LED5000. Remember to click on the Rafflecopter widget to indicate that you have commented and to increase your chances of winning, you can follow the rest of the options. The winner will be contacted by email and will have to respond within 72 hours or a new winner will be picked. 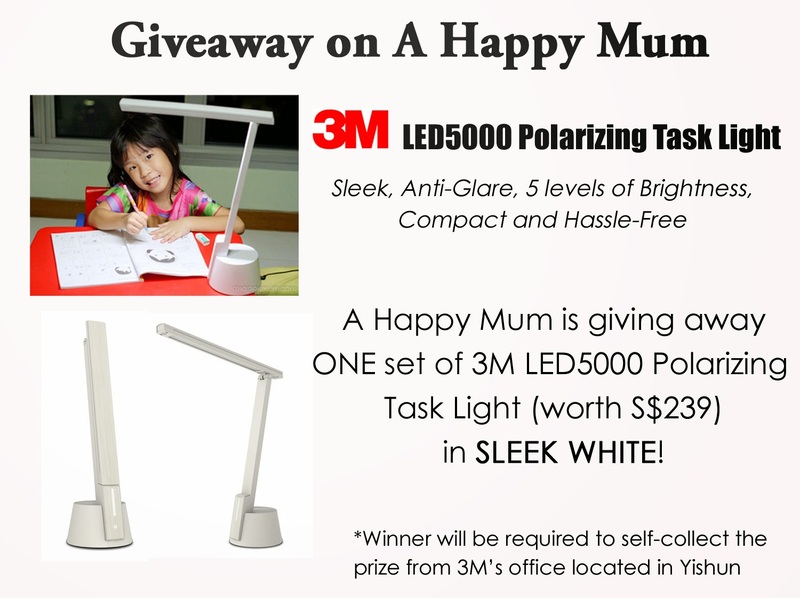 This giveaway is open to readers residing in Singapore only and the prize will have to be self-collected from 3M's office located at 1 Yishun Avenue 7, Singapore 768923.
a Rafflecopter giveaway The 3M LED5000 Polarizing Task Light is now available in two colours - Sleek White and Jet Black, retails at $239 (w/GST) and is available at Best Denki, Popular Bookstores and other leading retailers. For promotions and more information, visit their website or FB page. 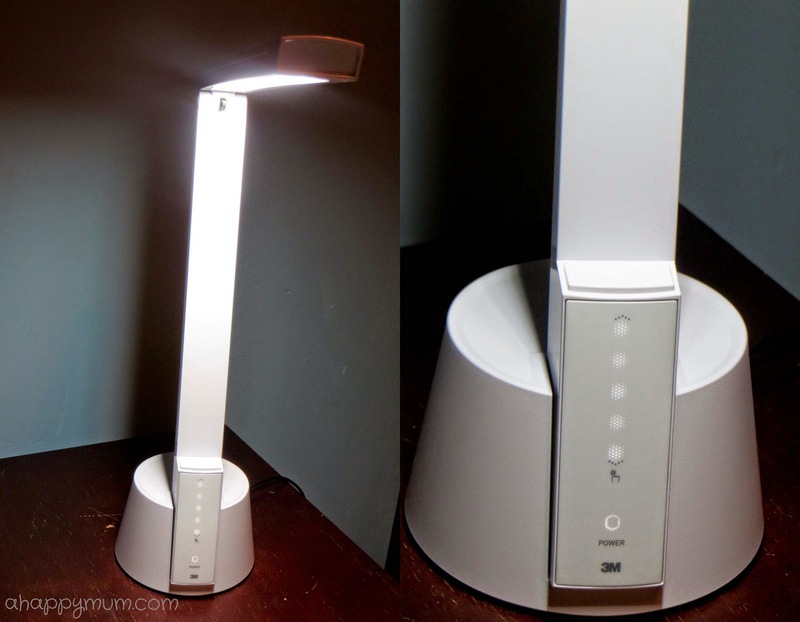 Disclosure: We were invited to the launch event of the 3M Polarizing Task Light LED5000 and received a sleek white lamp as shown in the pictures for review purposes. All opinions are our own. I love the tall & sleek appearance of the 3M LED5000 polarizing task light. I love the fact that its built with 3M polarizing fliter technology that reduces glare and ensure optimal light reaches the eye! My favourite feature of the 3M Polarizing Task Light LED5000 is it is fitted with 3M’s Polarizing Filter Technology, which consists of a 3M proprietary optical film to reduce glare by up to 80%. Consumes 1.3– 2Watts (a fluorescent lamp uses 30Watts or more) and lasts for up to 40,000 hours !! Ah, I realised there was a typo in my post previously, it should be 1.3-12Watts! Thanks for letting me know when I read your comment! =) Good luck! I love the anti-glare feature! I like that it is energy and cost savings. We can use it anywhere. My favourite feature is 3M’s Polarizing Filter Technology, which can reduce glare by up to 80%. I like 3M Polarizing Task Light LED5000 that it reduces glare by 80%, allowing me to read in comfort! Love the 5 levels of brightness! I like 3M LED5000 task light because it had no harmful rays, reduce glare, protect eyes, save cost and does not heat up and is safe for children to use. I like the tall and sleek design! Awesome for my small flat. Thanks for the awesome useful giveaway. Nicely expalined with the benefits of the Lamp. 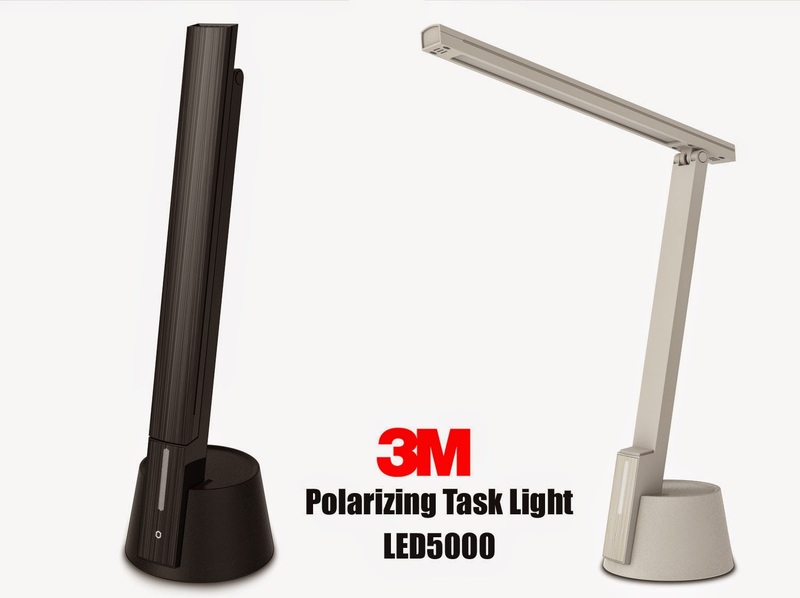 What i like about 3M LED 5000 TASK LAMP is its unique 3M’s Polarizing Filter Technology, which consists of a 3M proprietary optical film to reduce glare by up to 80%. While other lamps allow normal light rays comprising both comfortable and harmful light to enter, the 3M polarizing optical film only filters comfortable light through. Being a mom i care for my kid and wish to protect her from harmful radiations and provide her with a safe light.As she loves bedtime stories it would be safe for our eyes without any strain. Wish to win it for my kid. loves the polarizing film technology which removes glare! Portable & lightweight is one of the features I like. Wow.. 3M LED5000 Task Light looks good. Hope I can win it for my gal. I think our study room light is not bright enough for her. We are looking for a good table lamp for her. Hope 3M LED5000 can do the job and make the place brighter. I like that it is energy and cost savings !! I also love that it's anti glare. I love that it is energy and cost saving. I like it because it's safe for children. Space constraint trending in our flats has become a challenge for most HDB / Condo dwellers. The moment I set my eyes on this 3M polarizing lights, I fall in love with the space saving feature. It will be a great work companion to me and fit my study room decor! Thank you for the informative review. Because the 3M Polarizing Task Light LED5000 is gentle on our kid's eyes and is compact enough to place on the study table. My favorite feature is that the 3M Polarizing Filter Technology allows only comfortable light to pass through and converts all bad light into comfortable light, thereby reducing the amount of glare reflected on reading surface. I like that the LED5000 is fitted with 3M’s Polarizing Filter Technology which can reduce glare by up to 80%. Because glaring lights can harm our eyes and skin more that it may be better to stick to the ceiling light. That's why I like this feature of the LED5000!!! I like that it is fitted with 3M’s Polarizing Filter Technology, and it's anti-glare feature. 3M! What more can I ask for! Awesome giveaway! Love the polarising feature to reduce the glare. Thanks for hosting the giveaway. 3M’s Polarizing Filter Technology, which consists of a 3M proprietary optical film to reduce glare by up to 80%. I love this amazing product because of its sleek ans stylish design that is space-saving! I like 3M’s Polarizing Filter Technology, which can reduce glare by up to 80%. I love the anti glare feature which is very main for kid's studying. Hi! My favourite feature is that the LED5000 is fitted with 3M’s Polarizing Filter Technology, which consists of a 3M proprietary optical film to reduce glare by up to 80%. This is extremely important as the pages of some books are glossy which is actually harmful to eyes when the light is being reflected! My favourite feature of the 3M Polarizing Task Light LED5000 is that it reduces glare by up to 80% which minimize eye strain and allow longer hours of reading. No assembly required. I like that. The light is sleek looking and protect my children's eyes. What's not to like about it? My children bedroom's light is dim and i think it is would be so beneficial to have one of this polarizing light to prevent any myopia and protecting their little eyes. My favourite feature of the 3M Polarizing Task Light LED 5000 is that it reduces glare by up to 80% which is very beneficial to the eyes! Sleek looking as well as anti-glare! I love that it's energy and cost saving the most! The LED5000 is the rare kind of product these days that ticks both functional and aesthetics boxes. I absolutely like its good lighting intensity with anti-glare coupled with its space saving feature. Very welcome in space starved SG. It consists of a 3M proprietary optical film to reduce glare by up to 80%. I like that it is portable and lightweight so that it is convenient for me to work at different parts of the house with it. My favorite feature of 3M's LED5000 is that it reduces glare and protects the eyes! I love the filter! Been searching for a good light for my boys! Love the 5 levels of brightness. Can use it as night light too! I like the 3M Polarising Technology that reduces glare by 80%. My girls and I love to read. With the 3M polarizing optical film filtering comfortable light through (and converting the harmful rays into optimal lighting), it will minimize eye strains and allow us to devour our books comfortably! I like most the 3M Polarising Technology that emits a bright, steady, but non-glaring light. I Love its sleek design. I love its polarising film filter - helps protect the kids' eyes!